Are Flu-tracking Apps Really Useful? A report on NPR’s Market Place this morning prompts me to wonder if tech companies are compounding the misery of the flu by giving false hope. Does HIs Fever Mean He's Got The Flu? 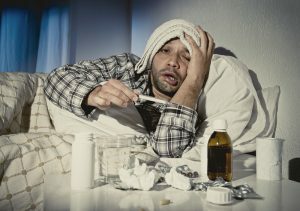 This year seems to be turning out to be a relatively bad year for the flu, which prompts everyone to want to know “is it coming to get me?” Or get my dearly beloveds? I probably don’t need to reiterate that this is a viral infection (and there’s not a lot in effective anti-viral medicines to treat it). It can make you pretty sick – or even kill you if you get a real bad dose or have some vulnerability. Because it often causes a fever, the tekkies have come up with ways to track who in an area has a fever – or at least the tekkies from Kinsa with their smart thermometer with accompanying app for smart-phones have. It is a digital thermometer attached to your phone that records your temperature and, with your permission, shares that, and uses fever as marker for where the flu is. I am all in favor of using a thermometer instead of the old palm of the hand on the forehead method - it is a common occurrence for a patient or more often parent, to tell you “oh yes there’s definitely a fever” but when you ask what the temperature is you discover this was not a vigorous, objective, scientific assessment. In other words a temperature isn’t necessarily the flu. Many, many other illnesses cause a fever. The makers of Kinsa seem to have taken for granted that a fever is a sign of flu, and report if there are lots of people with a fever in your local school or town. If the flu is around, this may be a “better safe than sorry” assumption I guess, but not infallable. It can be hard to tell between a mild dose of the flu and a cold – or upper respiratory infection (URI) to use the official lingo. Both may cause sore throat, sneezing, runny nose, but flu is much more likely to cause a fever, and often above 100 degrees Fahrenheit (37.8 Celsius). Also severe headache, marked body aches, and feeling like crap that lasts several days instead of just the first one to two days. And if there are several people in the area or you have been in contact with who have flu that makes it more likely any temperature is due to the flu.